Ten student entrepreneurs competed recently for thousands of dollars in cash prizes in the Massey College of Business’s 2019 Business Plan competition, a Shark Tank-style content. 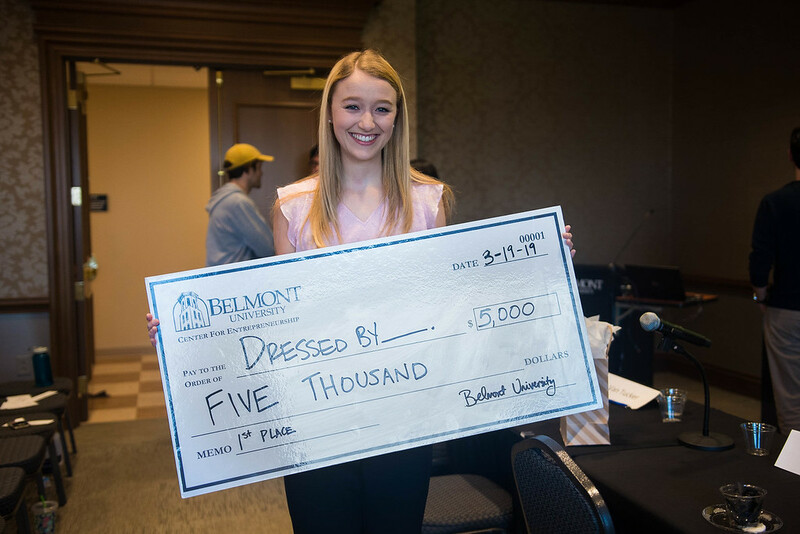 First place winner this year was Meredith Edwards who won $5,000 to support her planned business venture, Dressed By, a free service that would allow fashion bloggers to easily start their own online stores. James Richard and Ethan Akdamar took second place, $2,000, for Vitamin Honey, which would delivers customized vitamins inside sticks of honey. Third place and $1,000 went to Trenton Ryder for Degree of Freedom, an all American, handmade saddlery business providing the equestrian athlete with top of the line, quality equipment. The People’s Choice Award, voted on by the audience, was given to Hen House, a concept from Grace O’Shea and Claire Bidigare-Curtis which provides a platform where females in the music industry can practice their livelihood by setting up acoustic shows in comfortable backyard settings. This year’s judges panel included Phil Shmerling, founder of angel investment network InCrowd Capital and relationship manager at Studio Bank; Van Tucker, founder and chief creative officer of Avenue Bank as well as founder and CEO of the Nashville Fashion Alliance; Dan Hogan, a serial entrepreneur whose most recent venture was Medalogix, a healthcare analytics firm; Megan Feeman, Belmont alumna and founder and CEO of NoBaked Cookie Dough; and Victoria Kopyar, one of Belmont’s Entrepreneurs-in-Residence who brings a depth of background from a combination of her corporate experience at organizations including US Bank, Target, Dollar General and Gibson Brands.